THEA partners with Comite Bienfaisance and Promise for Haiti to begin a rehabilitation department at Hopital Bienfaisance de Pignon. A THEA-sponsored graduate of the Rehabilitation Technician Training Program (RTTP) in Carrefour, Haiti was hired on August 1, 2014. 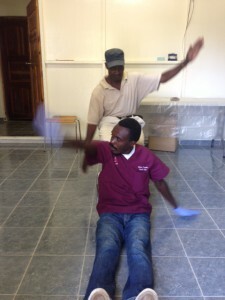 He is the only rehabilitation specialist working in this area of Haiti. He is responsible for providing rehabilitation services to adults and children in the hospital, through an outpatient clinic, as well as in satellite clinics in two smaller nearby towns. There will also be an opportunity for hospital staff and family/community education seminars on relevant topics in rehabilitation. Hopital Bienfaisance, an already world renown teaching hospital, will also be a site for students from the RTTP to complete their fieldwork requirements. Physical, Occupational, and Speech Therapists are encouraged to join us on trips 2-3 times each year to provide continuing education for the hospital staff and students as well as participate in community education seminars. Monthly costs ($600) to hire another rehabilitation specialist, a woman, and make the rehabilitation department (with prosthetic clinic) fully operational. $3800 to sponsor another student to complete the Rehabilitation Technician Training Program and become a rehabilitation specialist. We in THEA are eager to sponsor a woman to complete the program in order to more effectively address the functional needs of female patients as they learn to overcome disability and become more independent in their self-care and daily routines. Therapists to join us on our next trip to Haiti; or sponsor a therapist to go.